A Year of Being Here: Michael Van Walleghen: "Happiness"
that's his motto . . .
"Happiness" by Michael Van Walleghen, from In the Black Window: New and Selected Poems. © University of Illinois Press, 2004. 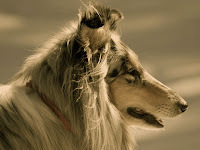 Photography credit: "Collie at Winter Time," by unknown photographer, found at this link (originally color).